Siemens “s300” is a line of elegant, modern, and intelligent coffee machines, designed to enjoy delicious coffee at home every day. 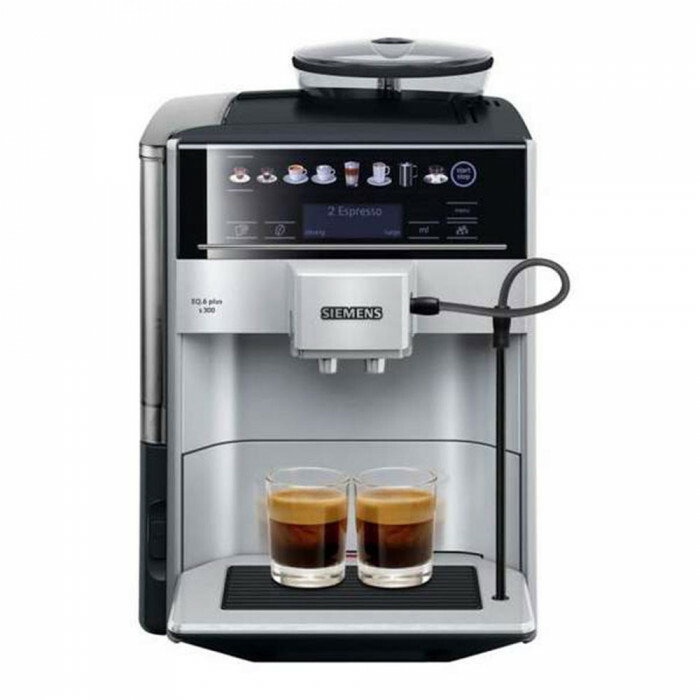 With this coffee machine, you can prepare two cups of Black Coffee, or Espresso at a time. And all of this – with just one touch of a button! The LCD display and convenient control panel layout with illuminated buttons will allow you to easily select your favorite drink, or to generate new beverage recipe according to your individual needs. In order to make the control of the coffee machine as simple as possible, you can select the desired menu language. Intelligent heating system “SensoFlow” warms up water to the required temperature in just a few moments. A high-quality adjustable ceramic grinder maintanse both flavour and aroma while grinding. The grinder is adjustable, meaning you will be able to grind coffee beans according to your individual needs. For those who would like to use ground coffee, there is a special drawer for ground coffee inside the coffee machine. Thanks to the “AromaDouble Shot” function, you can enjoy a cup of strong coffee without any bitterness. Your coffee will be prepared in twice – double coffee grinding and double coffee preparation will provide the most optimal coffee flavour. This automatic process ensures no unpleasant bitterness in the drink. The coffee spout is height-adjustable up to 14 cm, so even a tall Latte Macchiato glass can fit underneath. Convenient milk pipe allows to prepare any milk coffee beverage directly from the milk packaging. In order to save energy consumption, the coffee machine automatically shuts off when not in use for some time. This coffee machine automatically rinses the entire coffee preparation system after each prepared cup of coffee, as well as everytime the coffee machine is turned on or off. After preparing a coffee beverage with milk, run entire milk system rinsing with just one press of the button. Great hygiene will not require much effort!